Enrique Norero, MD, Camilo Boza, MD, Alex Escalona, MD, Fernando Crovari, MD, Gustavo Perez, MD, Fernando Pimentel, MD, Luis Ibañez, MD, Nicolas Jarufe, MD, Sergio Guzman, MD, Ricardo Funke, MD. Universidad Catolica de Chile. Division of Surgery. Department of Digestive Surgery. Introduction: One of the critical steps in laparoscopic total gastrectomy is the esophago-jejunal anastomosis, being an important source of postoperative complications. 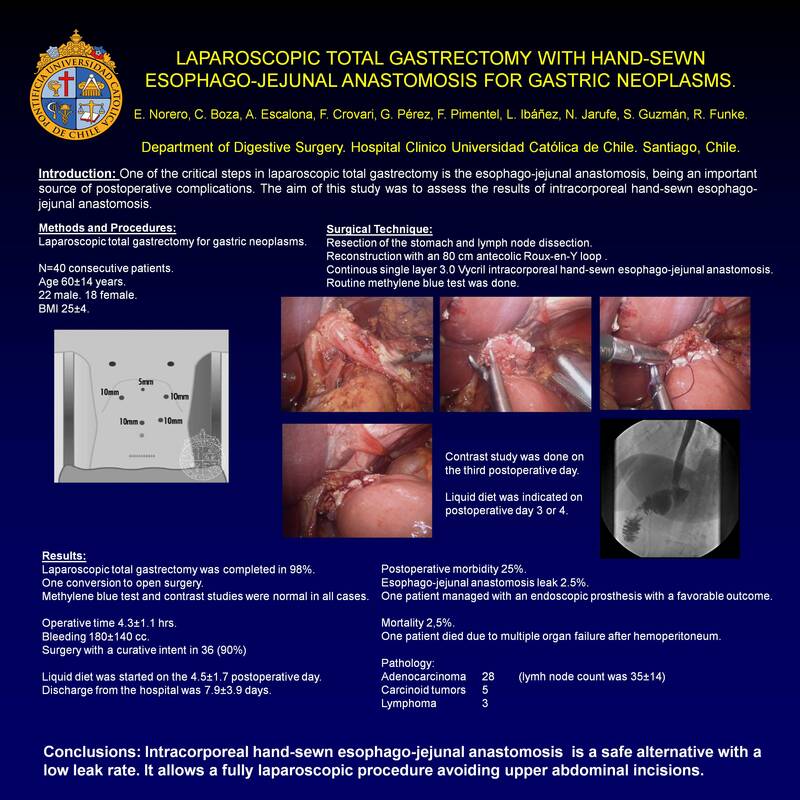 The aim of this study was to assess the results of intracorporeal hand-sewn esophago-jejunal anastomosis. Methods and Procedures: The study included 40 consecutive patients (age 60±14 years; 22 male; BMI 25±4) who underwent a laparoscopic total gastrectomy for gastric neoplasms. We used four 10 mm trocars and one 5 mm trocar for liver retraction. After resection of the stomach and lymph node dissection, reconstruction was done using an 80 cm antecolic Roux-en-Y loop . A continous single layer 3.0 Vycril intracorporeal hand-sewn esophago-jejunal anastomosis was then performed. All surgeons had extensive experience in intracorporeal suturing mainly from obesity surgery. A methylene blue was routinely done. Contrast study was done on the third postoperative day and a liquid diet was indicated. We review the indications for surgery, intraoperative details, operative time, postoperative results and pathology results. Results: Laparoscopic total gastrectomy was completed in 39 of 40 patients (98%), with one conversion to open surgery. Hand-sewn anastomosis was performed in all the laparoscopic cases, with a negative methylene blue test in all of them. Operative time was 4.3±1.1 hrs. Bleeding was 180±140 cc. In 36 (90%) cases surgery had a curative intent. All contrast studies were normal. A liquid diet was started on the 4.5±1.7 postoperative day. Average discharge from the hospital was 7.9±3.9 days. Postoperative morbidity was 25%, with one patient presenting esophago-jejunal anastomosis leak (2.5%). This patient was managed with an endoscopic prosthesis with a favorable outcome. One patient died due to multiple organ failure after reoperation for postoperative hemoperitoneum. Pathology analysis confirmed 28 cases of adenocarcinoma, 5 gastric carcinoid tumors and 3 gastric lymphoma. In cases of adenocarcinoma with curative intent the lymh node count was 35±14. Conclusions: Intracorporeal hand-sewn esophago-jejunal anastomosis is a safe alternative with a low leak rate. It allows a fully laparoscopic procedure avoiding upper abdominal incisions.